Oh my word, this clever book is an absolute hidden gem. B.A. 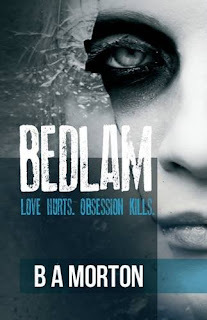 Morton is a local North East author whom I was fortunate to meet to sign my copy of Bedlam. I am speechless and completely in awe of the quality of the writing in Bedlam. B.A. Morton has written a book with so much smoke and mirrors that I questioned my own sanity almost as often as I questioned the main character's. A town called Bedlam conjures a vision in my head of lawlessness and insanity. So when Joe McNeil attends a crime scene in Bedlam and brings one of the 'corpses' back to life, I prepared myself, as much as I could, for ANYTHING to happen. Joe's girlfriend, Kit, is missing presumed dead. That is, she's presumed dead by everyone EXCEPT Joe. He will never give up searching for Kit, and now it seems that the girl he brought back to life, Nell, knows something about Kit's disappearance. Joe is prepared to lose everything, even his mind, to find out what happened to Kit. I found myself wondering whether Nell was simply manipulating Joe for her own ends or if she really did know something about Kit's disappearance. The character development of Joe and Nell is absolutely superb. I felt as if Joe had been turned inside out and we could see exactly what made him tick but at times I didn't know what was real and what was inside Joe's head. Nell was another matter; she is very mysterious and just when you think you get a glimpse of the real Nell, B.A. Morton would pull the rug from underneath you. I would imagine that every single reader would be thinking the same question about Nell: who is she??? Fear not, you will find out when the time is right. Bedlam is so immersive, addictive and utterly breathtaking. It was so easy to get drawn into Joe's story and I found that I was thinking about Bedlam in between periods of reading it. If you're looking for a high quality book filled with suspense that will keep you on your toes, look no further and rush out to buy a copy of Bedlam right now!